Thank you all for your helpful advice! I have started packing a bag and I thought I would post a little update here. We had an awful experience when Sunshine was born. We brought home a horrific stomach flu along with our tiny pink bundle of joy. Even my sweet SIL who was taking care of The Professor for us became so ill on her flight home that friends had to rescue her at the stopover airport before she could continue her journey home. My mother caught a flight a day earlier than scheduled to come take care of all of us. So, call us paranoid, but after that experience, we don't like to stay in the hospital for very long and we usually don't have visitors, family or friends. I also don't like bringing anything that can't be washed once we get home. Every pregnancy is different, but my track record doesn't indicate whether or not I'll be able to labor at home. With both of the boys, I went into labor spontaneously (9 days late) and labored 12 hours before they were born. With the girls, I slowly started dilating over the last few weeks of pregnancy. When I was 9 days late and sitting at 6cm. without being in active labor, my midwives admitted me to the hospital and broke my water to induce. So, if this little girl follows the "girl pattern" I might not get to labor at home. If she decides to be different, then I would welcome that opportunity! Everyone who knows me thinks this one won't be as late as the others, but we'll just have to see. While I don't have a midwife this time around, I do have a lovely doula coming and she will labor with me here at home until it's time to go unless we start out at the hospital, then she'll meet us there. She will also take pictures for us so forgetting the camera is not such a big concern. So, I have a bag now (that can be washed) and it's filled with some of the practical things y'all recommended including a few special requests from Husband. Apparently, I ALWAYS pack Pop-Tarts for him! He's so cute. I also have a nightgown, socks, flip flops for the shower, some toiletries and a few other things I might consider tossing in at the last minute. But this will be the first time I will deliver at a hospital only about 15 minutes away from home as opposed to 45 minutes, so anything I might want that gets forgotten can be retrieved pretty easily. Isn't it just beautiful? Basically, an Irish bishop escaping persecution fled to Europe and was offered shelter by a bishop in Hungary. This image that he carried with him was given as a gift of thanks. A miracle was later associated with it that is still honored today in Hungary. 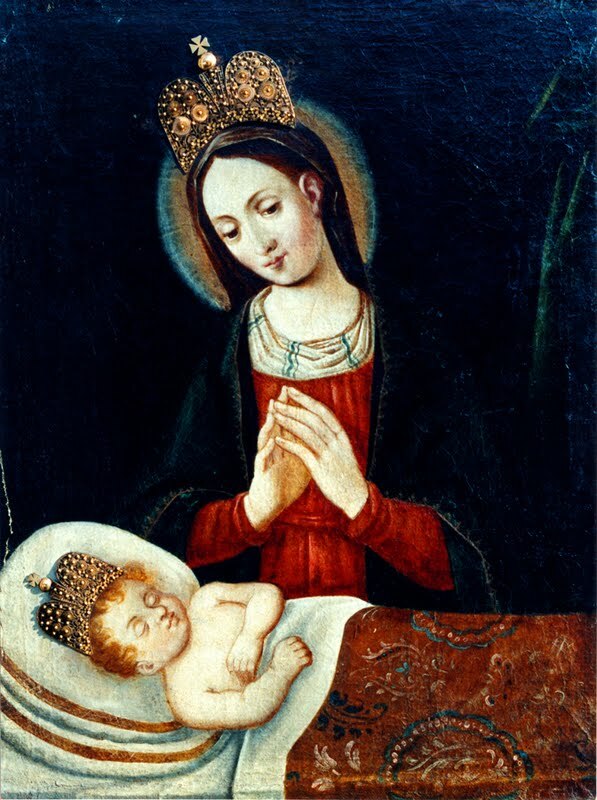 You can read more about Our Lady of Clonfert also known as the Irish Madonna of Hungary over here. Oh...and for those of you who don't know, I mentioned the red raspberry leaf tea because it's great for controlling excessive post-partum bleeding. That's why I've started drinking some everyday already. It helped tremendously after BigBoy was born! Twenty four days (+9) and counting! I don't even want to think about packing a bag. I'm also in the camp of wanting to spend as little time as possible in the hospital. I was quite dismayed to find out two weeks ago that the hospital where I will deliver likes to keep you for 48 hours after birth. I already know I'm going to have to lobby to get the pediatrician to discharge the baby after 24 hours. Personally, I'd like to go home a few hours after delivery, but my husband will never go along with me signing myself and the baby out of the hospital against medical advice. If your pattern of having girls nine days late and my pattern of delivering at 38 weeks on the nose continue we may be welcoming our new daughters in the same week. What a horror story about the stomach flu! I recall only being able to "visit" on Sunday afternoons during a very short window of time. Otherwise, Dad would drive us to the parking lot and we would all stand outside and look up at her window while she would wave hello with our new bundle of joy. Lots of prayers from la casa Borobia! I'm sure back then staying in a hospital was a bit of a luxury. Nowadays it seems like more of a hassle because of all the red tape and bureaucracy. I've had nurses come in and wake me up to draw blood samples, testing for who know what. I've had nurses insist that they have to change the baby's sheets at midnight because that's when their shift changes, even if the baby was asleep. I've had technicians come in every four hours all night long to check my blood pressure (which is always normal). I can't seem to rest in the hospital and try to get out as soon as I can. With Shortcake, we were out in 24 hours! Charlotte,I was able to prevent many of the night interruptions on my last baby by calling the nurse when my baby woke up to eat. I'd tell them "now's your chance...come do anything that needs doing." They actually were very cooperative!